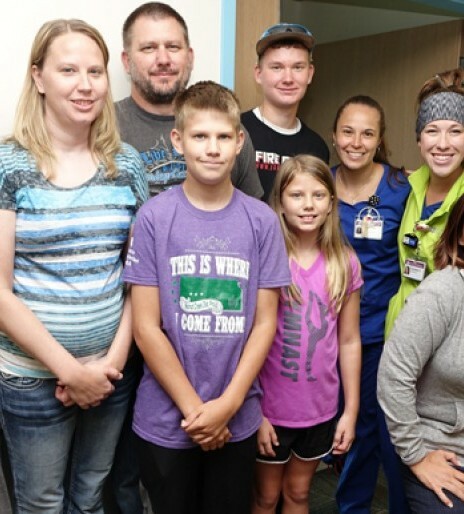 Dayton Copeland received a warm welcome from the pediatric care team at Madonna’s Omaha Campus. “Just kind of excited to see everyone again and here for a different reason,” said Dayton. The Kansas teen is here today to reunite and catch up with his former nurses and therapists on what he’s been up to over the summer. “Umpiring baseball games playing basketball," said Dayton. Dayton headed back to school in the fall after suffering a traumatic brain injury in December 2016 stemming from a 2-vehicle car crash near his home in Ness City, Kansas. “Came to us not speaking no opening his eyes not looking up. He could sit in a wheelchair partially with some help and not really responding to outside stimulus much," said Dr. Snyder. In the early days, Dayton’s family relied on faith, prayers and Madonna for hope. "First day they come in and they say, ‘well, we’re going to walk.' “Two of them got him up from the wheelchair and they parked him right here in sitting here going what? He’s not awake. How are you going to walk him? In the middle of the room and they stood up and one of them is holding his head up and they’re both holding him up and they’ll just touch his leg and say, ‘Take a step, Dayton,’ said Angela Copeland, Dayton's mom. Angela says New Year’s Eve is when her son seemed to wake up, becoming more aware of his surrounding and situation. Through intense physical, occupational and speech therapy he made tremendous progress before heading home in March. “When I got out of here started golfing right away,” said Dayton. Receiving hardware for his efforts. Now he’s gearing up for deer season. “He loves to hunt, so we’ve been building blinds and starting to get on to doing mounts,” said Nathan Ness, Dayton's dad. “The amount of therapy that he got as intensely as he got, is absolutely the reason he’s recovered as quickly as he has. He was here for quite a long time but he’s made extraordinary steps in his recovery. I would not have thought he would be going back to school this year if you would have asked me last winter,” said Dr. Snyder. "With the type of brain injury that he had, most people do not come out of it like this and he’s almost his old self,” said Angela. Moving forward, Dayton keeps his favorite Bible verse close to his heart. “It’s Philippians 4:13: ‘I can do all things in Christ who is my strength,"’ said Dayton. "These people were part of our family for a long time. We miss them but we didn’t want to be there in that situation again. They’ll always have a place in our hearts and minds,” Angela.